Sharpies are AWESOME! I teach 1st grade and we need us some SHARPIES! We go through so many highlighters during reading, science, and social studies. They help 1st graders remember what is important by using them to highlight the important facts or info. The permanent ones help labeling our things in the classroom. We would love to win the Sharpies! Thank you for supporting teachers and the children that are our future! Hope you and your students have a great school year, Vickie! Every one else, head on over to our new giveaway for your chance to win a class-size 60-pack of Elmer’s School Glue Sticks. Good luck! a dozen of the original waterproof, smear proof and fade resistant Sharpie fine-tip permanent markers! a set of odor-free Sharpie Accent Highlighters! Subscribe to Office Ink via email or RSS. Follow On Time Supplies on Facebook & share the giveaway on your Facebook page. Follow On Time Supplies on Twitter and re-tweet the giveaway. Leave us a comment on this post telling us why you should win! The Sharpie Giveaway ends next Monday, July 15. You can pick up extra entries by entering on Facebook, Twitter and Office Ink. We’ll announce the winner Wednesday, July 17. Good luck! I think I should win because my family goes through Sharpies like crazy because we love using them for so many things. I have not tried the highlighters and would love to. It would be so awesome to have these FABULOUS markers and highlighters to use in my classroom. I would love to win these for my classroom! I LOVE Sharpies! I have an addiction and buy several packs every year (they seem to have feet and walk away). I have used the highlighters for years and have never found any I like more. Thanks for the opportunity to win a set of the best markers out there. I love Sharpies for all kinds of projects and day to day uses in my classroom. My students are always looking for Sharpies too!!!!! As a special education teacher, I am constantly making charts that have highlighted words, important words in different colors, or picture clues to help my students use the resource with ease. I individualize lesson plans for 40+ students and these markers would help me to create resources for the students that hone in on they’re individual learning styles. I buy so many items in order to individualize each child’s work, so winning these markers would also help me financially for the beginning of the school year. Thank you! School is starting in August and I need new pens to correct papers! I should win because I use sharpie products in my classroom daily. I teach my students to use the highlighters as a testing strategy to find answers or identify important information in text or word problems. This set would be very useful in my classroom. I would love to win the Sharpie Accents and 12 pack because we never have enough sharpies in art! My art students love them, and so do I! LOVE Sharpies – I think every teacher does! Since our budgets are tight, we get supplies that aren’t worth a hoot! They think they are saving money buying the cheap stuff, but we end up just throwing them away because they are cheaply made! Thank you for the opportunity to win QUALITY supplies for my classroom! We appreciate all that you do for teachers! 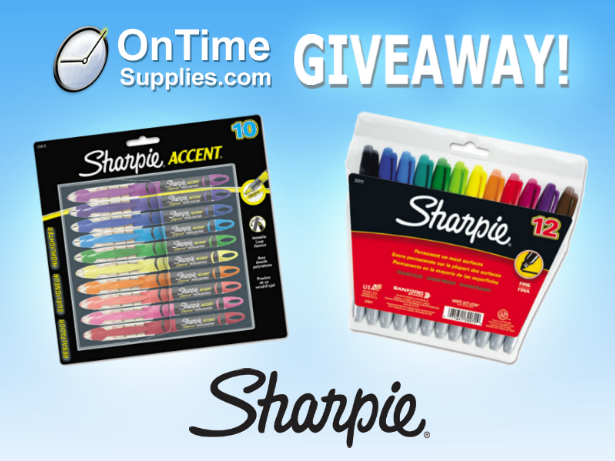 I would love to win the Sharpies to use in my classroom. My students are never as motivated to work as when they can write with Sharpies! Sharpie products are awesome! I would love to win them for my classroom. I should win because I use Sharpie markers all the time in my classroom. I should win because I will give them to my daughter; she is an inspiring artist. This is a fun win! Think of all the creativity! I love Sharpies! I use them constantly in the classroom. I love sharpies!!! I use them all the time in my classroom. Sharpie’s are awesome! They are great for labeling everything. There are so many uses in the classroom! Our family Loves Sharpies! We are always using them, whether it’s for teaching, craft projects, home projects..or even jotting grocery lists. We can’t walk near a display without checking it out and buying the newest thing from Sharpie. LOVE IT!!!! I’m a poor public school teacher’s aide that can’t afford to buy the GOOD school supplies for my students. I deserve to win these super Sharpies! My students use sharpies for so many of our different labs. Our favorite one is using them on transparency paper and them drawing the ecosystem as they see it in nature and then they bring it in and finish coloring it and labeling it. Just like what many people have said, I’m a teacher and could really utilize the Sharpies in my classroom. And like many have said, I do not have a large budget either. I would be so blessed to win the markers or hi-liters. Thank you so much for giving us the chance to win the product. I love scrapbooking, especially when my 9 yr. old son helps me. Anytime I get a new product he can’t wait to try it out! I love scrapbooking especially when my 9 yr. old son helps. Whenever I get new supplies he can’t wait to try them out! I love sharpies and adding color to my life! I would love to win and thank you for the chance. I shared the post on facebook and on twitter. I do a school supply drive every year and this would be a great addition! L-O-V-E Sharpies! I purchase them throughout the year and would love to win these for my classroom!!! Thank you for supporting education!! I love sharpies. They are a must have in any classroom. They are great uses for labeling things, especially plastic bins and you don’t have to worry around the ink coming off. I really need new sharpies. I love these and I am on such a limited budget. I promise I will share whatever I win with others who might be in need of new supplies.. Thank you and Blessings! I will have my own classroom for the first time next year, and when I started making my list of necessities Sharpies was at the top. Congrats on your your first class. Sharpies are my best friends. ..besides my my husband. I’ve loved Sharpies for years and still use them for everything! I should win because I’m a homeschooling mama who is obsessed with office supplies! These would come in handy for use in my business. I should win these because I love to use them but always seem to lose them. I’d like to have a bunch of them so I can find one when I need it. would love these for my classroom! i love to make anchor charts so these would be perfect to make my artwork stand out! NOTHING works like a Sharpie! I am starting this school year in a “turnaround school” with has VERY little supplies, from what I CAN order, Sharpies are a “must have” in my classroom! My oldest daughter loves Sharpies – so much so that she was 5 she drew “rain” on the exterior of our house with a blue sharpie. (It did finally come off the siding after months of scrubbing and sun exposure). Luckily she only draws on paper now but she still covets Sharpies and her birthday is coming up. My students use sharpies for so many projects. I love all the colors that are available so that my students can express themselves with color! I always have sharpies on my wish list! I think education should be fun, colorful and ALIVE. One of my requirements each year is a pack of colored pencils or markers which I have the the students use at least once a week. I believe winning these supplies will help me cultivate a love for learning in my students. I would love to win this because scrapbooking is my hobby. My stationary in that needs a makeover.